I've had flourless cake before... but flourless cookies?! When my friend Abbie made these for our South African wine dinner, I had the "why didn't I think of that?!" moment. In fact, I'm drawn to recipes that tend to be ones that seem so obvious to me yet new and different at the same time. 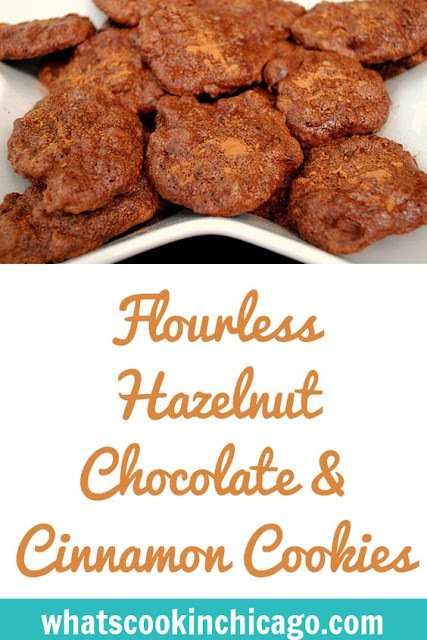 These were rich, chocolate cookies without the guilt because they're made with whipped egg whites [think angel food cake]. The original recipe comes from a South African caterer in Johannesburg, named Tony Scorgie (based from the recipe source.) We're not sure if there was anything South African about this particular recipe, aside from the original creator. Regardless, this was a delicious cookie that was light yet flavorful. 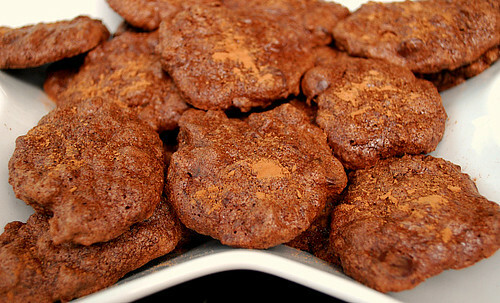 There's a slight chew in texture and the dusting of cocoa powder makes it extra chocolaty. Preheat oven to 325 deg F/160 deg C, and line a baking tray with parchment. Mix the ground hazelnuts (weighed after being ground), confectioner's sugar, cinnamon and cocoa powder in a bowl. Whisk the egg whites and superfine (castor) sugar together until stiff peaks form. Fold in the hazelnut mixture and dark choc chips. Spoon tablespoons of the mixture on the tray, but leave about 2 inches between each spoonful to allow for spreading. Bake for 12 - 14 minutes. Lift out on to a cooling rack. Dust with cocoa powder before serving. Sounds delicious! I love hazelnuts! These look so good! I'll have to try them!